Elections of the President of Russia in summer of 1996. 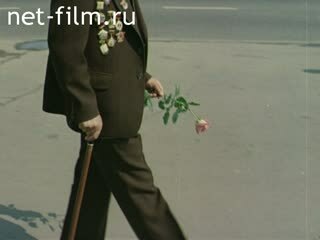 The film tells the story of the election of the President of Russia in the summer of 1996. The film was filming the following: the people at the rally in Moscow, Boris Yeltsin's speech (synchronous), the species was Petersburg, a resident of Petersburg. Speech E. Rossel (synchronous), voting soldiers in Chechnya, interview voters, voting members of the Russian government, the species G. Vladivostok, Khabarovsk, meeting the press center, signing documents on the cessation of hostilities in Chechnya between Lebed and Maskhadov. The chronicle of the events of October 1995 in Moscow. Acts Alexy II. The people are on the street. People go to the rally. Young people at the rally. A man is looking, PNRM. To the Order. The people at the rally waving flags. The people at the rally are holding placards in their hands. At the rally stands Boris Yeltsin (synchronously). Domes of the Kremlin cathedrals. Deputies go to the Kremlin. Foreign guests in the hall of the Kremlin Palace. Foreign guests greet N.Yeltsina and others. Coat of arms of Russia. The people in the hall at the inauguration of Boris Yeltsin. Those sitting in the hall get up. Boris Yeltsin is on the scene. The people in the hall. B. Yeltsin utters the oath of the Russian president (synchronously). Listeners in the hall, PNRM. On the stage. Listeners in the hall get up. B. Yeltsin, Patriarch Alexy II and others on the stage. Flag of Russia, PNRM. On the towers of the Kremlin on Manezhnaya Square. People are running with machine guns. Explosion in the street (removed from the window). The tank is passing by. Nurse at the bedside of the patient. Surgeons operate on the wounded. The bullet is in the hands of the surgeon. Says Russian Defense Minister P. Grachev (synchronously). Chechen women with a poster. Chechen men play on folk instruments. The Cathedral of Christ the Savior in Moscow. B. Yeltsin with his wife, etc. in the service in the temple. B. Yeltsin approaches Alexy II. Carry a photo of the journalist Nadezhda Chaikova, who died in Chechnya. Women are standing with candles, PNRM. On the man. Flowers are put in the coffin. A woman is crying, a man is laying flowers. The rally on Pushkin Square. A woman is holding a poster. The people at the rally, PNRM. On the posters. People with disabilities ask for charity. Hand, PNRM. on the face of the homeless. The homeless (homeless) is sitting on the stairs, and begging. People walking on the street. Through pages of the magazine - multrabota. It should be a veteran. Veteran at the Tomb of the Unknown Soldier. War veterans at the Tomb of the Unknown Soldier ..
Veterans sitting at the table. Listen to the woman, PNRM. on the order. There is a girl under the umbrella. Stand with caricatures of presidential candidates. There is an old man. The driver in the car. Talk to the boy and girl. Yeltsin's campaign headquarters. B.EltsinV hall is Anatoly Chubais. The daughter of Boris Yeltsin T.Dyachenko. Members of staff - Satarov and S.Shahray. Animation: magazine cover, turned over the page. Boris Yeltsin with his wife and daughter - photos. The people at the poster. Dancing youth, PNRM. Monument to V. Lenin. Jumping girl with the ball. The protesters are on the streets. Moscow Mayor Yuri Luzhkov, Yeltsin and others at City Hall. The people at the rally welcomes Boris Yeltsin. A man with a child in her arms. Ostankino Tower, PNRM. at TV center. Girls sing ditties (on the screen). Fragment of the program "Dolls". Reporter with a video camera. Yeltsin talks with the audience at the polling station. The people at the rally. A monument to Karl Marx. Gennady Zyuganov comes to the polling station. Screen monitor program fragment "Dolls". Members of the Communist Party in the demonstration. The people on the streets welcomed the demonstrators. Reporter with a video camera, PNRM. demonstrators. Infomercial Yavlinsky (removed from the monitor). Detail of TV show "Field of Dreams." Vladimir Zhirinovsky and the Liberal Democratic Party members go to the meeting. Vladimir Zhirinovsky on the podium. The people attending the rally. Mikhail Gorbachev and his wife. Mikhail Gorbachev and Boris Yeltsin in the presidium of the congress. Journalists at the polling station. Gorbachev speaks with journalists (synchronously). Photos Lebed on the cover of the magazine. Lebed at a reception in the Kremlin. Fragment of the program "Dolls". S.Fedorov during surgery. S.Fedorov riding a horse. S.Fedorov among artists. Vlasov away from the platform. Photo M.Shakkum. M.Shakkum suited to the car. Photo V.Bryntsalova with his wife. V.Bryntsalov with his wife in the car, PNRM. on the poor. Bryntsalov his wife among journalists. Drunk woman, PNRM. the man. Zyuganov and his wife sitting at the table. Zyuganov handed a basket of berries. Photo: A woman kisses Zyuganov. Boris Yeltsin at a meeting with voters. Boris Yeltsin at the stadium meets with voters. Yeltsin danced with the ensemble. Yeltsin waves his hand. 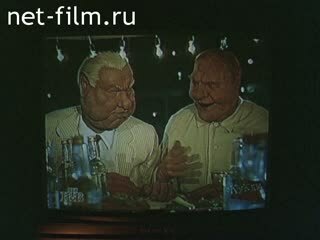 P. Grachev and Yeltsin at the table. Yeltsin dancing with a woman. Yeltsin greets the crowd at the rally. Yeltsin holding a monkey and transmits it Korzhakov. Yeltsin greets the workers of the Baltic plant. Boris Yeltsin talking to workers. Workers at a meeting with Yeltsin. The grille, lowered into the mine elevator. A woman comes to the car. Yeltsin greets the audience at the Palace Square in St.
Says Governor Eduard Rossel in Yekaterinburg (synchronously). Yeltsin and his entourage go to the meeting. The people at the rally, PNRM. on flags. Photo: Boris Yeltsin to the soldiers in Chechnya. Yeltsin talking with a soldier (removed from the monitor). The hand holding the gun. The soldiers on the tank. Yeltsin talking with soldiers (removed from the monitor). The soldiers at the polling station. Soldier puts the urn newsletter. People go to the polling station. Voters come out of the cab. People out of the polling station. Interviews with voters after the voting. The people at the polling station. He says the man Elderly woman signs the log. Woman with child gives interviews. Solzhenitsyn and his wife go to the polling station. Solzhenitsyn and his wife at the polling station. Zyuganov voting at the site. Chubais and goes down the ballot. A.Korzhakov out of the cab and down the ballot. Votes V.Bryntsalov. V.Shumeyko vote. M.Barsukov vote. Square, PNRM. on the building. Entrance to the press center, PNRM. at the cameramen. The press center includes a team of Vladimir Zhirinovsky. Entrance to the press center. Placards with the results of voting, PNRM. in the hall. Interview people on the street. The girl down the ballot in the ballot box. The landscape (shot from a helicopter). Villagers go to the polls. Interviews on the street of Rostov-on-Don. Interviews with his family to the area. The sign, PNRM. the door. The car enters the gate. Interviews with the family on the street. An interview with a veteran of the war. Vladimir Zhirinovsky with his wife. Yeltsin puts on a sweater. Enter Boris Yeltsin and Lebed greet. Swan gets up and shakes hands with Yeltsin. Flying the flag of Russia. At the polling station are A.Korzhakov, Sh. Lebed and Aslan Maskhadov sign documents. Lebed and accompanying after signing. Brokers at the stock exchange. Interview of President Vlasov Exchange. The people at the building. With polling station in Krylatskoye out and goes to Viktor Chernomyrdin told reporters. "Doll" in the form of Zyuganov. Newsreel 1993 .: The people at the rally. Lit building of the White House in Moscow. The fight in the street. Military with machine guns at the wrecked car. The people on the square at the White House. Lit White House, PNRM. flag. A woman lights a candle. Burning candles, PNRM. the man. The people at the White House at the rally. The book in his hands. Emblem of Russia, PNRM. the stage of the Kremlin Palace. The inauguration of Boris Yeltsin. Speech Alexy II. Hall of the Kremlin Palace. The final moment of the inauguration. People with flags and banners at the rally. The man with the newspaper. A woman with a newspaper.